Online courses (WEB) offer students the opportunity to complete the work for a particular course via the Internet and eLEARN. Online courses are a good choice for self-motivated, self-directed students who need classes on a flexible schedule. To complete all requirements for these courses students must be able to access the Internet from home or another location. Students may access the Internet through computer facilities at the college's library on the campus in Morristown or at the campuses in Greeneville, Sevierville, and Claiborne, or anywhere else they have access to the Internet. The College is not responsible for obtaining or maintaining students' individual equipment or software for accessing the Internet. 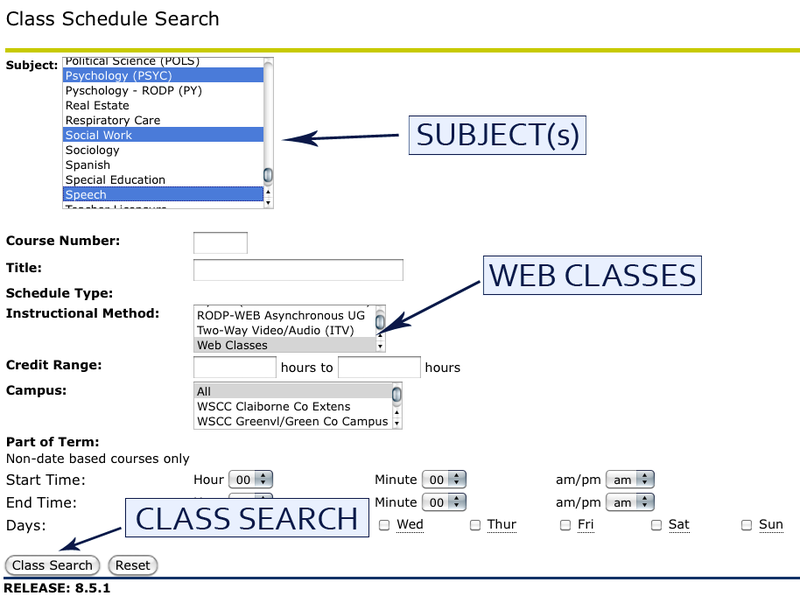 Most online classes do not require any on-ground visits to any campus. Coursework is completed entirely through eLEARN. Library services, tutoring services, and all other student support services are obtainable through eLEARN or other electronic means. Students should check the "WSCC Links" on the home page of eLEARN for many services and online assistance. If students have difficulty with eLEARN, help is provided through either the WSCC HelpDesk (423.318.2741) or Instructional Design in the Division of Distance Education.